An elusive knife for an elusive prey. Okay, I’ll admit it. I actually bought this knife for the box! I’m not a major fan of melon testers as I don’t have a real use for the pattern. (that , and the only time I was robbed at knife point was by some punk wielding a 7 inch melon tester!) So much for my bias toward the knife! 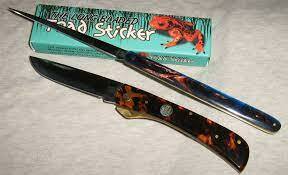 The blade on the Toad Sticker is a very slender and tapers evenly from tang to tip. This is unlike the typical melon tester which is normally a long spear blade that for most of its length is the same width from spine to edge. The blade is 4.5 inches long At just 3/8 of an inch wide at the tang, you can imagine how pointy the blade is. The Match striker pull is located around mid spine and the blade opens smoothly with little effort. Because of the thin profile of the blade, I was able to penetrate heavy cardboard almost effortlessly. It was also quite easy to push the knife through an inch thick uncooked pork chop and the side of 7 inch blue gill which stood in for a bullfrog. The blade is also razor sharp but because of how thin the blade is, I’m reluctant to cut anything more than paper or cooked meat. I would not use it for carving or whittling. The blade is not designed for such work. I also would not try pushing the blade into anything like wood as this in not a leather punch or awl. I suspect the tip would bend or break. Nor is the knife an ice pick. You can use it to poke melons and/or frogs! And even if you’re not into gigging frogs, there is still the box! The frog pictured on the box appears to be a Bastis Strawberry Poison Dart Frog native to Panama. The knife that comes in the box is also one very cool sticker. 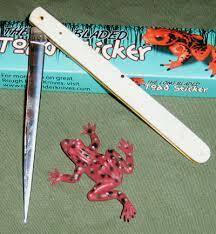 *The white smooth bone Toad Sticker is becoming increasingly hard to find. I'm not sure if Rough rider plans to re-release the pattern. 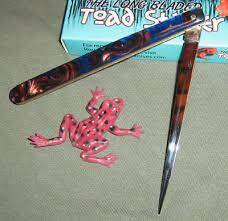 I think the knife should offered in smooth bone or celluloid in a Tree Frog Green color. Red spotted to match the box art would also be interesting. This would also make a very intersting fixed blade knife pattern I could see a thin bamboo handled knife with this type of blade being extremely useful at gigging frogs.I might have a conversion project in the near future involving this knife. Of course, a Tortoise Shell Toad Sticker also seems like a logical choice..